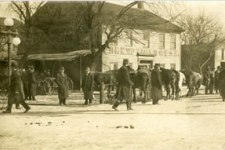 Travelers and locals stopped by the Pre-Emption House hotel and tavern. 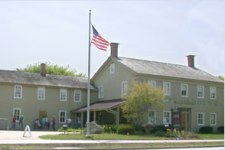 Naperville’s Pre-Emption House was one of the earliest hotels built west of Chicago. It was named after a federal law that allowed settlers to reserve up to 160 acres. A steady stream of easterners and immigrants journeyed west to claim land sold for just $1.25 an acre. Settlers passing through town on the north-south or east-west stagecoach routes kept business brisk. 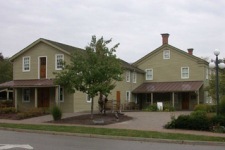 The Pre-Emption House offered a traveler a shot of whiskey, a bed for the night and breakfast, plus feed and stabling for their horse all for 35 cents. The Pre-Emption House was not a stopover but a destination for Naperville residents. In the tavern, locals conducted business deals and celebrated with dances. They ate meals in the dining room. 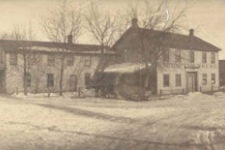 The Pre-Emption House hosted official government business before the construction of the first DuPage County courthouse in Naperville in 1839. Monthly Horse Market Days in front of the hotel drew farmers and dealers from all over to haggle and show off their horses. The Pre-Emption House was built in 1834 on Main Street and Chicago Avenue. It was torn down in 1946. 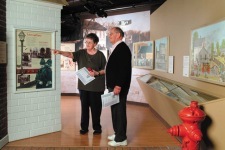 This re-created structure now serves as Naper Settlement’s visitor center.